During the middle of last week I decided it had been way too long since I had been fishing for fun. This semester has been full of work for me, so I was eager to get out. In fact, I hadn't done anything except tournament fishing and pre-fishing since moving to my new place. After some contemplating I talked with toba (Bob) and we decided to hit a local river. I got to the river around 10:30 AM and quickly prepped my yak and gear. I realized I had forgotten my seat and my life jacket. A moment of panic overcame me, as I never leave without a life jacket and forgot I had actually hung it up in my closet (for a change). Thankfully Bob had an extra and off we went. We paddled about 2 miles up river and started fishing. I tied on a Deep Creek Lures floating worm in a green pumpkin color, a Deep Creek Lures Razor Beetle in a candy grass color, a shad colored spinnerbait, and a Strike King jig with a Deep Creek crawdad trailer. Bob and I both agreed that the bite would be slow, as water temps were pretty cold, but I was hoping the wind would push around some bait fish and cause a spinnerbait bite. About 20 minutes into the float I got my first bite and landed a chunky little 14.5" fish. He hit a 6.5" Deep Creek floating worm fished on a texas rig. Then, save a few bites, I went over an hour without landing a fish. I lost one fish that hit as soon as my worm hit the water and another that bit so lightly I barely felt him and was late setting the hook. Bob was having some luck on the other side of the river and landed a pretty 17.25" bass. Finally, I landed my second fish - right around the 14" mark. It also came on the Deep Creek floating worm in a green pumpkin color. I was fishing it on a 1/4 oz. texas rig and the finesse style seemed to be working better than the razor beetle, jig, and larger worms. Fish #2 - glad it wasn't my last! Then the bite started to pick up. I am not sure if it was finding a pattern with the smaller worm or the fact that the sun was slowly warming up the river, but either way, the bass started getting active. After landing a few solid fish, I landed a pretty 17" largemouth. Then I ended up landing 5 fish in a 40 yard stretch of bank - 4 of which were caught on the same Deep Creek worm and 1 on the Razor Beetle. The biggest went right around 4 lbs and was an extremely healthy fall fish. After that I landed one more bass - a 12"-13" fish that would be my last of the day as both Bob and I had to head for the trucks. I was really happy to have gotten out on the river and even happier to have caught some solid fish in the cool water. All of the bass felt cold to the touch, but most of them still had nice colors and hadn't developed the typical red lips yet. And today, all of my fish were caught on Deep Creek Lure plastics. This will most likely be my last trip in the "old", green kayak for quite some time. Although I will miss it, I can not wait to go pick-up my Jackson Coosa in 2 weeks! Happy Thanksgiving and tight lines! Nice report. I might be looking into getting a kayak soon. Trying to figure things out. If it happens it will be in the spring. Thanks Kev. 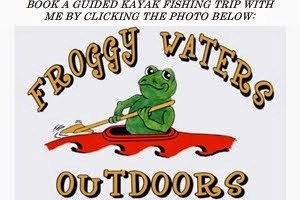 As of December 3rd I will have an extra kayak (and paddle), so if you want to go after that just give me a shout. Last December I had some really good days on Jordan catching crappie and cats, but I bet we can still find some hungry bass somewhere! I'm ok with catching anything. Seems very exciting, even it's cold now. Thanks Jun! It was definitely a good day.